The Duchess of Cambridge first wore this Tory Burch frock to Prince George's first official engagement; a playdate with the Plunket Society. This was also the first time we had seen Kate wear a piece from the American designer. The 'Paulina' dress is from the Resort 2014 collection. 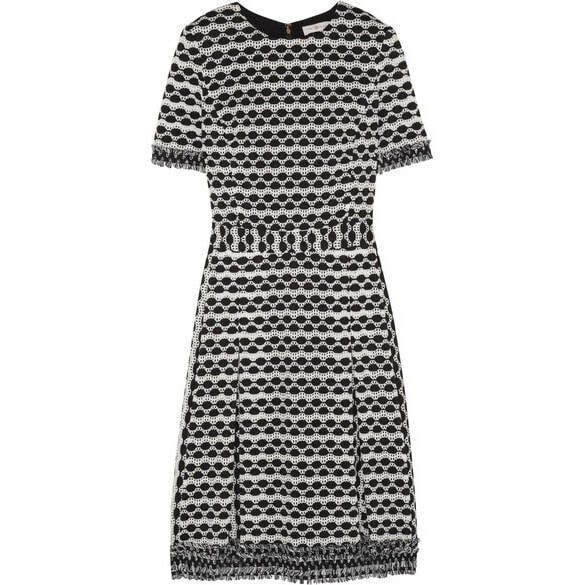 The dress features an alternating white open-knit and solid black knit pattern. The fit-and-flare silhouette is defined by a cinched-in waist and a pleated skirt. The short sleeve cuffs and hem are finished with tactile fringing. STYLE FILE: Tory Burch Paulina Dress as seen on Kate Middleton, The Duchess of Cambridge.